There is considerable variation in the nature, scope and institutional forms of legal protection for valuable geographical brands such as Champagne, Colombian coffee and Darjeeling tea. While regional products are increasingly important for producers, consumers and policy makers, the international legal regime under the TRIPS Agreement remains unclear. 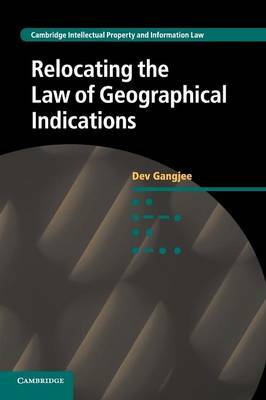 Adopting a historical approach, Dev Gangjee explores the rules regulating these valuable geographical designations within international intellectual property law. He traces the emergence of geographical indications as a distinct category while investigating the key distinguishing feature of the link between regional products and their places of origin. The research addresses long-standing puzzles, such as the multiplicity of regimes operating in this area; the recognition of the link between product and place and its current articulation in the TRIPS definition; the varying scope of protection; and the extent to which geographical indications ought to be treated as a category distinct from trade marks.